Pension Monika is situated in the heart of Liptov region, in a peaceful area surrounded with green and a beautiful park, close to the town centre of Liptovský Mikuláš (only 250m). Liptovský Mikuláš is a small historical town with a pedestrian mall flanked by cafés, bars and restaurants offering excellent service as well as shopping and entertainment facilities or museums and galleries for people interested in history and art. You can also experience the world of darkness and silence in 2 caves (Sloboda Cave, Ice Cave) in Demänova valley. The top attraction of Liptov region is Tatralandia aquapark opened throughout the whole year where adults will appreciate swimming pools with thermal water and children different water attractions, slides and toboggans. A new sauna centre Tatra-Therm-Vital offers the best relax including a large variety of procedures with healing effects. Families with little children should spend some time in a western town Šikluv Mlyn situated next to the aquapark. Summer time is good for hiking, cycling, horse riding and adrenaline sport, e.g. rafting, paragliding. The best place for water sports, e.g. windsurfing and yachting is Liptovská Mara dam. Liptovský Ján and Bešeňová are well-known resorts with thermal water which has cosmetic effects. In the winter you can enjoy downhill skiing, snowboarding, cross-country skiing and alpine skiing. 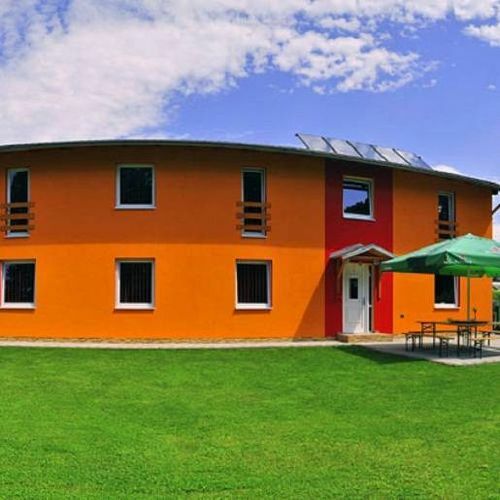 Pension Monika is a new 2-storey ecological building fashionably furnished offering 7 triple bedrooms (an extra bed is available) and 1 double room with an electric fireplace (max. bed capacity: 30). Each room is equipped with en suite bathroom with a shower unit, toilet and washbasin. For our guests there is a large relaxing lounge area available (seating capacity: 32) with a fireplace, satellite TV as well as a little corner with a fridge, microwave and kettle. Hot summer days and evenings can be spent relaxing and barbecuing in the garden. Reserve your accommodation and Privát Monika Liptovský Mikuláš will directly send the confirmation in 1 workday. The rating of Privát Monika Liptovský Mikuláš is 10 from the maximum 10, 7 based on actual and valid guest ratings and reviews.